Masterbatches with high percentages of (nano) additives (>20%) in granular form, with good thermal stability at processing temperature and dispersed uniformly into the matrix due to their improved flowability and uniform dispersion of nanofillers within masterbatch has been developed. Diluition of the master batch to the accurate nanofiller final content in function of the requirements of the part. Masterbatches have been produced in an independent and controlled way within the consortium. Masterbatches have been produced, controlled and repicated in the same conditions. Nanofillers embedded in the polymeric matrix. The plasmonic colours and diffractive gratings effects will be implemented in an industrial process where the structures are defined using injection moulding. 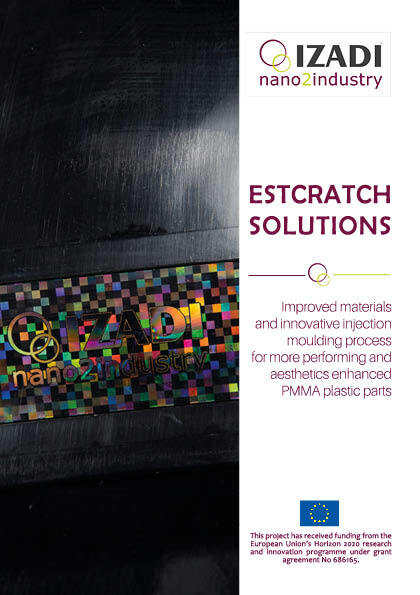 Read the complete results of ESTCRATCH PILOT!